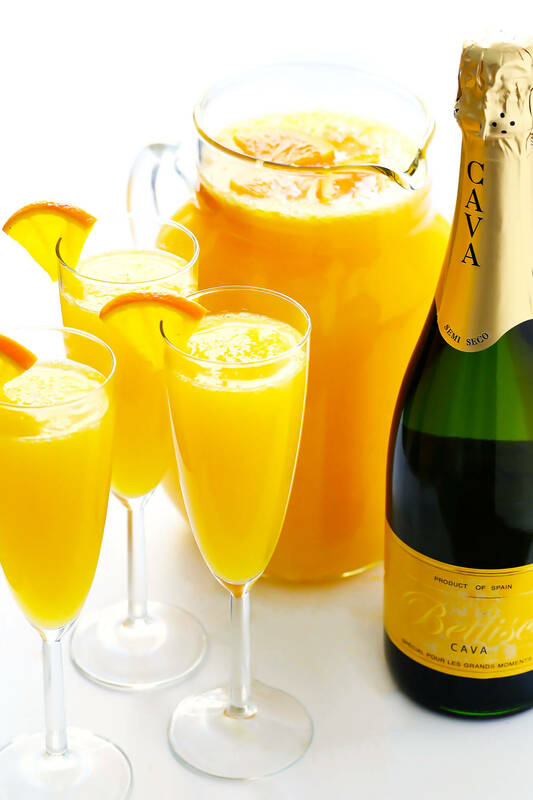 Learn how to make mimosas with this classic mimosa recipe. Plus, tips on how to customize your drinks (including a non-alcoholic version), and make pitcher mimosas for a crowd. That said, wherever in the world you may find yourself, I feel like we could all do with a bubbly celebratory cocktail this weekend. So today, I have a bunch of tips for you for how to make the best mimosas quickly, affordably, creatively, and — most importantly — deliciously. So grab a bottle of bubbly, and let’s make a round! Alright, to begin, let’s talk glasses. 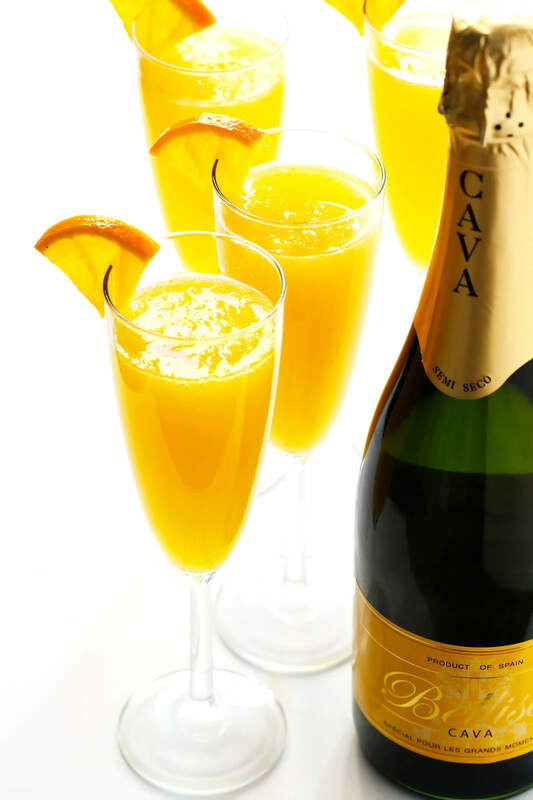 Since sparkling wine is involved, mimosas are traditionally served in champagne flutes, which helps to preserve the bubbles and dry taste of the wine. You can go with the classic stemmed glasses, or stemless glasses. Or if you don’t have any champagne flutes at home, any glasses with a narrow opening (such as white wine glasses) will work well too. Gather your glasses and have them ready to go before serving. (And if you really want to impress your guests, pop them in the freezer for 10 minutes before serving so that the glasses are nice and chilled.) Then gather your ingredients, and let’s get to mixing! Dry Sparkling Wine: In my opinion, dry or semi-dry sparkling wines work best when it comes to wine for mimosas, in order to balance out the sweetness of the orange juice. I prefer sparkling wines from Spain (Cava), Italy (Prosecco) or the United States, since they are usually much more affordable than their French (Champagne) counterparts. And since we will be mixing the wine with a strong fruit juice, there’s no need to splurge on a fancy bottle of sparkling wine for mimosas. A mid- to lower-priced bottle will work great! Orange Juice: That said, I would definitely recommend purchasing a nicer carton of 100% orange juice for your mimosas. (Avoid anything from concentrate!) 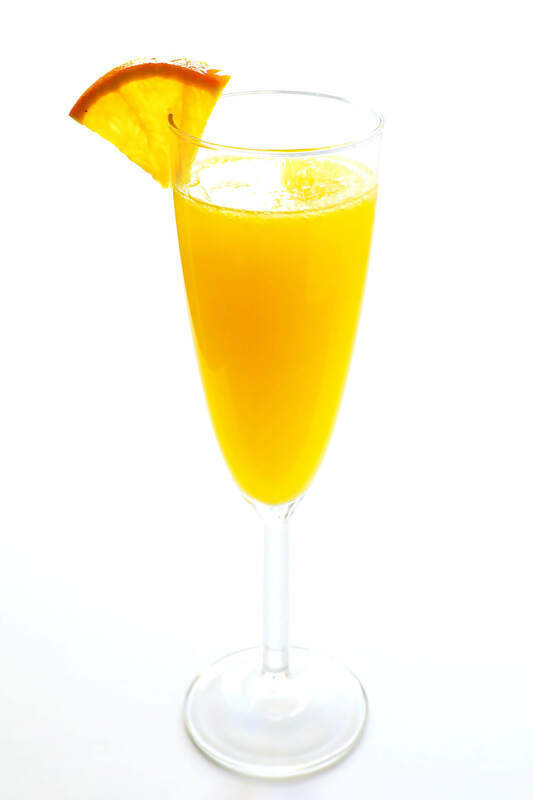 I’m a big fan of pulp with orange juice in general, so I usually just use that to make our mimosas. But a heads up that the bubbles will float some of the pulp to the top of your glass. 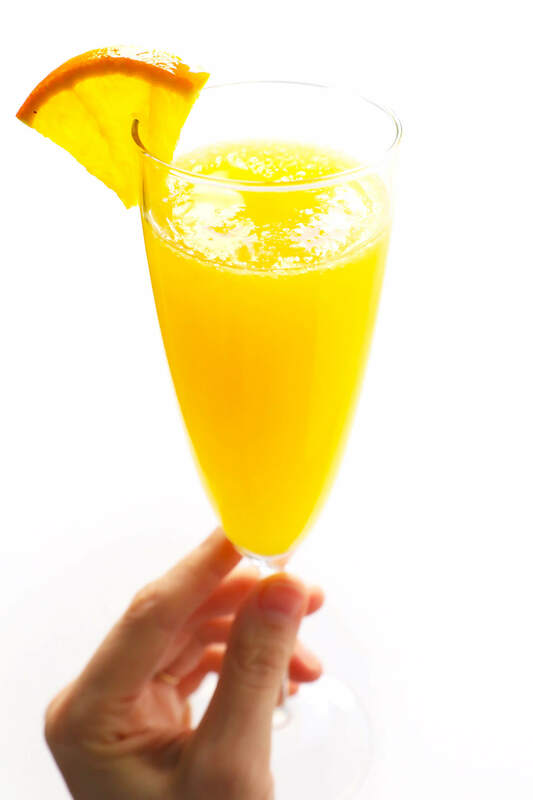 So if you would prefer a smooth, clean top to your mimosas, use a pulp-free orange juice. St. Germain: I love adding in a little splash of elderflower liqueur to my mimosas. It adds a very subtle depth of flavor (and extra kick) that friends always comment on and love. 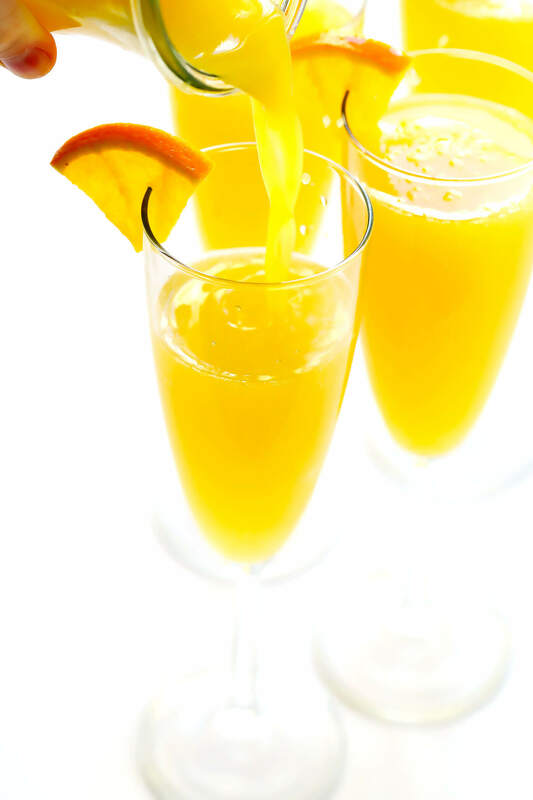 Grenadine: A little splash will give your mimosas a lovely gradient “sunrise” effect. Orange Liqueur: If you want to kick your drinks up a notch without straying from the orange flavor, feel free to add in some Cointreau or Grand Marnier. Rose Water or Orange Blossom Water: These non-alcoholic add-ins can add a lovely floral note to your mimosas. Fresh Herbs: A sprig of fresh sage or lavender or rosemary can also add a lovely herby note to your mimosas. This is always the big question with mimosas, and the answer is simple: it’s totally up to you! 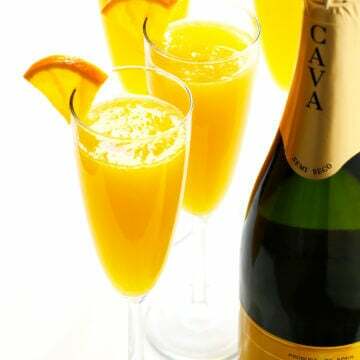 I prefer my mimosas to not be overly sweet, so I’ve always opted for 2 parts sparkling wine and 1 part orange juice. But the classic ratio calls for 1 part sparkling wine and 1 part orange juice. So feel free to experiment and go with whatever sounds best to you and your guests! The beauty of pouring individual servings is that you can easily customize each drink to taste. Alright, once your glasses and ingredients are all chilled and ready to go, it’s time to mix! Simply pour your desired amount of sparkling wine into your champagne flutes, careful not to let the sparkling wine fizz and foam too much on top. (We want to preserve those bubbles!) Then top with orange juice. Garnish your glass with a little orange slice, if you would like. Or, if you would prefer to make a large pitcher of mimosas for a crowd, simply repeat those steps in a large glass pitcher. Add the sparkling wine and orange juice. Then pop it in the fridge for up to 10 minutes before serving. Pour…and serve! Granted, anytime you stir or transfer sparkling wine between glasses, you will lose a significant portion of the bubbles. So the pitcher method will not be quite as fizzy. But if you’re looking to save a step while entertaining, the pitcher method is a great option. Why add the sparkling wine first? This will help preserve some of the bubbles (especially if you pour the wine slowly with minimal foam). And — more importantly in my book — it will avoid that sticky mess that can sometimes happen if you pour champagne on top of the orange juice and accidentally overflow your glass. The bubbles are much easier to control when you add the orange juice to the sparkling wine, instead of vice versa. Do you need to stir the drinks? No, no, no, no, no. The bubbles in the wine will help this drink to mix on its own. So avoid stirring (even in the pitcher). Otherwise you will lose some of those precious bubbles! Do you need to add ice? Nope. 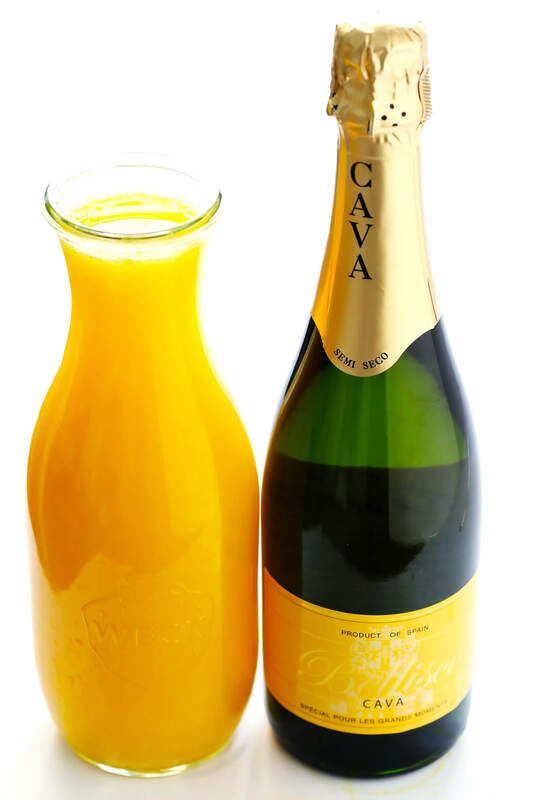 Just have your orange juice and sparkling wine nice and chilled before mixing, then serve immediately. 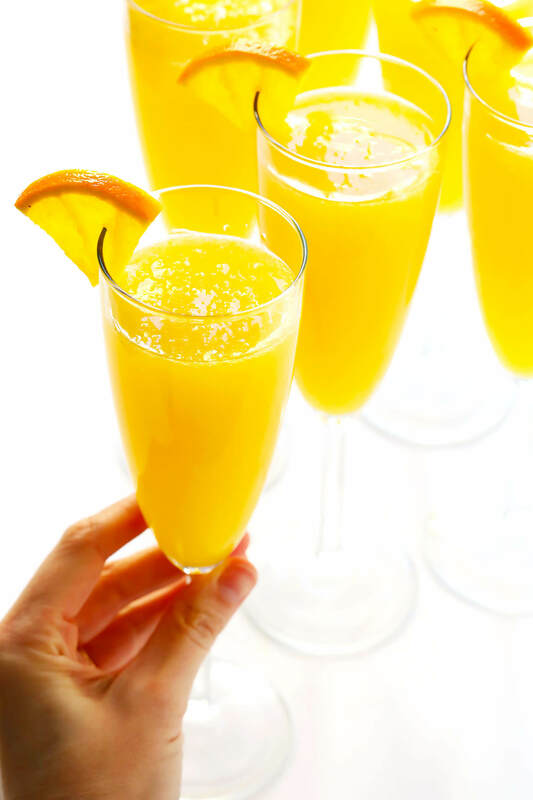 Learn how to make mimosas with this classic mimosa recipe. Plus, see tips above for how to customize your drinks with various add-ins, if desired. For A Single Serving: Slowly pour the sparkling wine into a champagne flute until it is about 2/3 full. 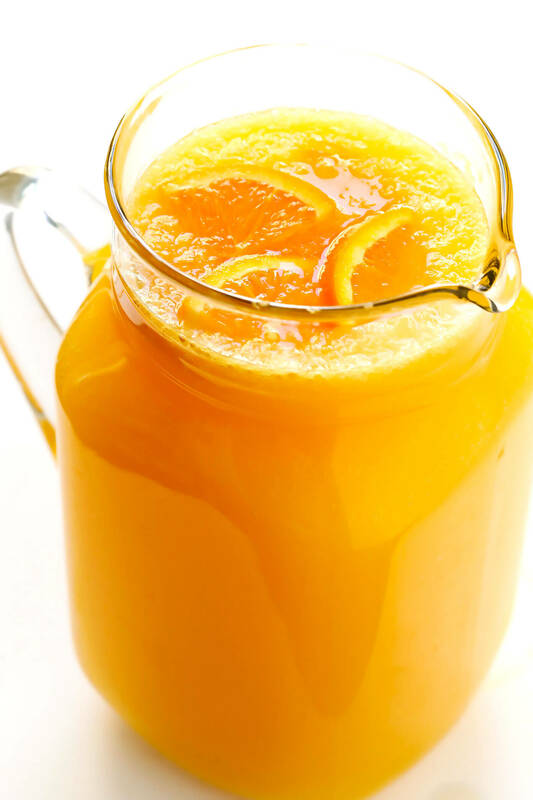 Top with orange juice until the glass is full. (Do not stir.) Serve immediately, garnished with an orange slice if you would like. For A Pitcher: Slowly pour the sparkling wine into a large pitcher. Top with your desired amount of orange juice (I recommend 1 ½ cups). Do not stir. Refrigerate for up to 10 minutes. Pour into champagne flutes and serve.